When I go up country to see Pookie’s family in Issan we always head to Mukdahan first where her parents live , although technically they live in Nakhon Phanom as well but that is a story for tomorrow. Each time I see the house in Mukdahan there is a new addition and this last trip was no different. The main house is a standard village house with concrete floors and walls on the first floor and the second floor built out of teak. The first floor serves as living room/bedroom for the kids, kitchen area and storage areas. The second floor is all for Mama and Papa. This means that the living room area becomes a bedroom at night for the children. They lay out their mats and thats where they sleep on the concrete floor. Well, it seems little brother, who is 16, decided he needed a little more privacy so a little hut was built on the side of the house for him. I thought it odd at first that he would have a place separate from the family and honestly I still think it odd. The only private rooms in a rural Thai house seem to be for the parents/grandparents. Pookie has another brother who is 18 and even he still sleeps with the family. Either way he seems to be putting his new room to good use as you can tell by the beer bottles lined up by the door and the new addition of a table by his front porch. It’s a good thing he’s a small lad and not claustrophobic at all. I’m really hoping my dollar goes a little further when I do make the move to Thailand…but if the house comes with beer there might be room for negotiations. A bit of a strange set up, but if the parents and the young lad are happy then alls fine. The only worrying thing would be if the amount of beer bottles grew and then turned into empty lao khao ones. If the brother is helping the family work wise or at least still a big part of the everyday family life then perhaps he just wants that little bit of growing up space. Definitely a situation to quietly and thoughtfully monitor, afterall beer bottles have got to be funded from somewhere and I’m guessing he doesn’t have any paid work. .-= Martyn´s last blog ..Thailand At Work – Isaan Hotel =-. Hmmm… it doesn’t seem very Thai-like, does it. It’s more Western really, as we usually feel a greater need for our privacy. 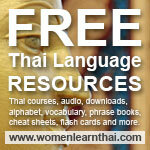 .-= Catherine´s last blog ..Thai 101 Learners Series: No Need to be Tongue-Thai’d Anymore =-. Martyn, no, he doesn’t have any work he’s still in school. Sometimes he helps his Uncle or brother on the weekends and makes a few baht. Actually he’s rather lazy most of the time. MAma has gone to Pattaya to be a maid because Papa has found a new girlfriend so it’s an odd situation at the moment. Talen, ah, I can’t blame the little fella for wanting some space. OK it’s probably more Western, but when your 16, there are certain things you can’t do infront of family no? I think it’s very good of your Thai family to make the effort. Hope he appreciates it! .-= Ben Shingleton´s last blog ..Chula Hospital Visit – Keep the Swine inside the Mask please! =-.